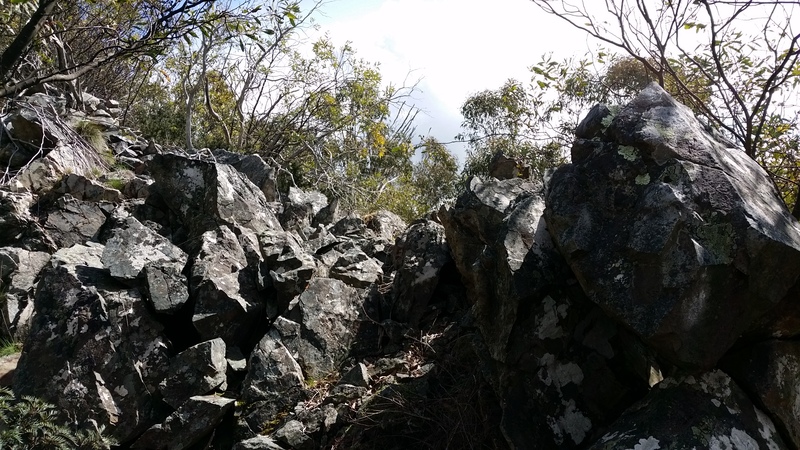 Previous SOTA activator: One only, me! That’s right, I was last on this summit on 15 June 2013 and no one from the VK1 SOTA troop has followed until now. 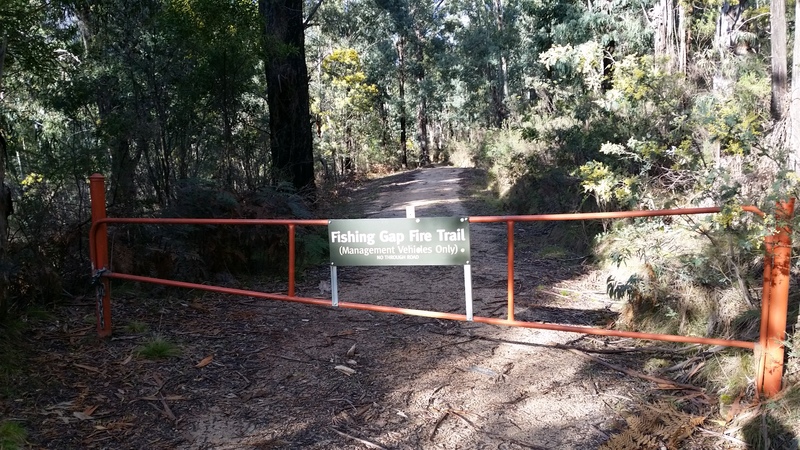 After taking a rest at Fishing Gap we ventured in to the scrub heading north-east following a newly developed walking trail to spot height 1390 metres ASL. 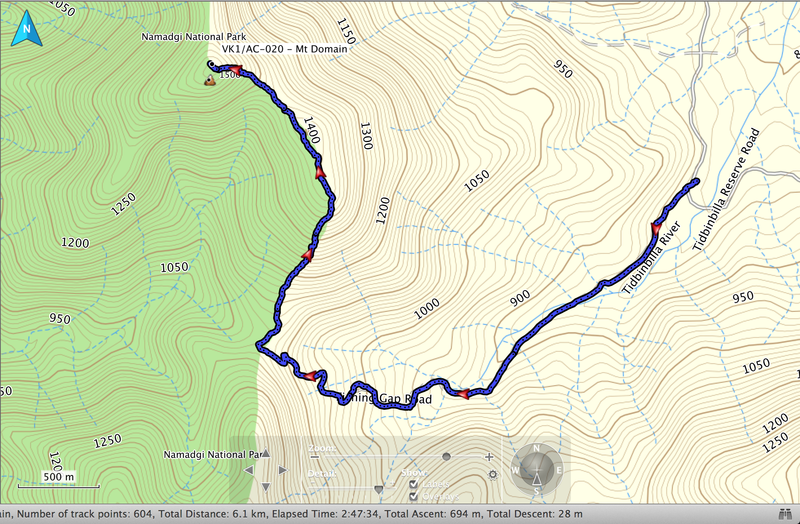 This leg is 1.1 km taking 55 minutes with an average gradient of 24%, its bloody steep! 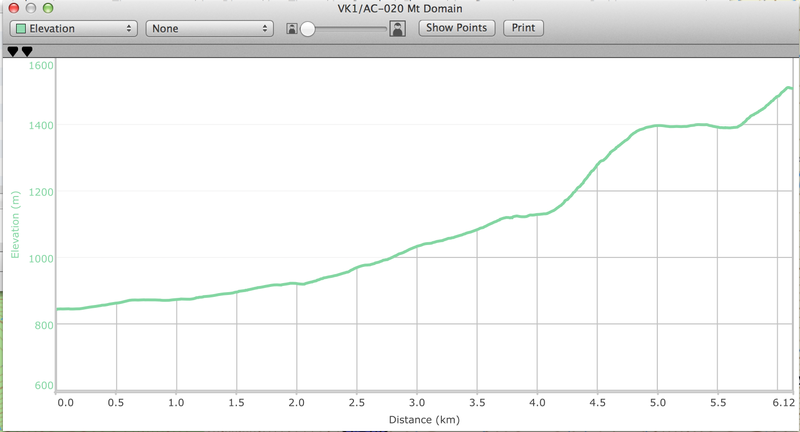 The last leg is 1.2 km taking 48 minutes with an average gradient of 10%, easier than that previous leg. 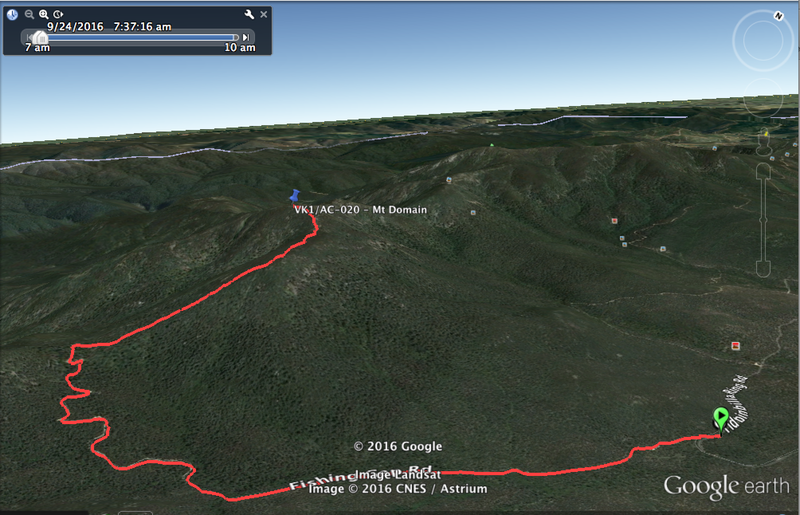 Track profile, as you can see from the profile the tough section is a 300 metre ascent over 1 km between 4 and 5 km. 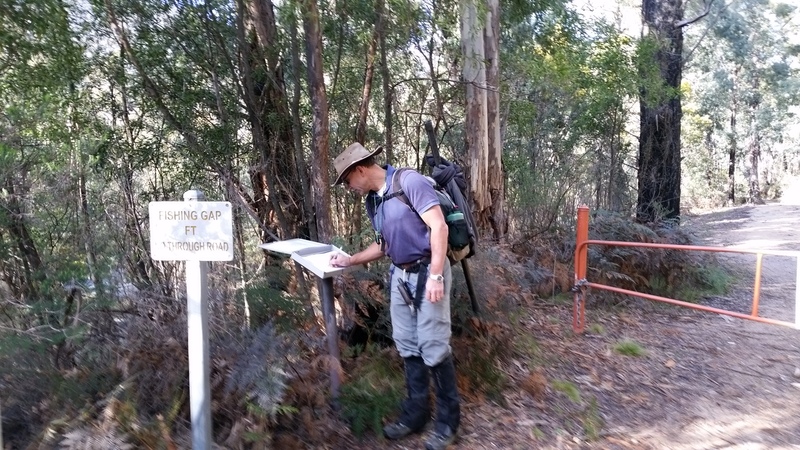 Mt Domain ascent data. On a flat track the average person can walk 5.5 km in an hour. 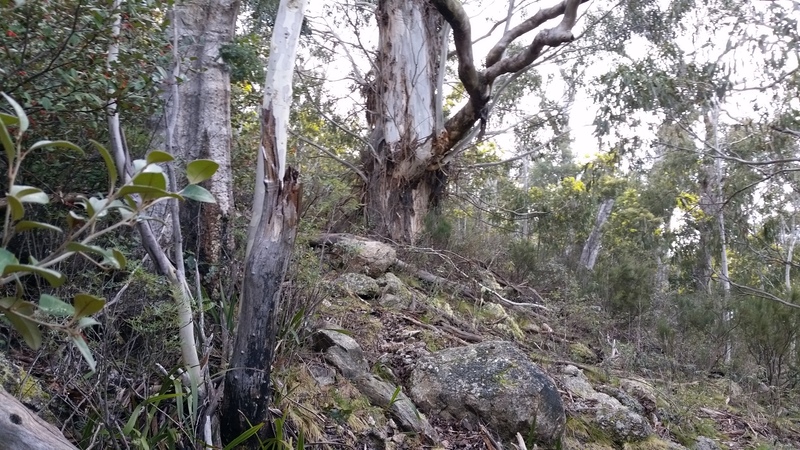 Pictures of Mt Domain to help explain its position on Tidbinbilla Range. 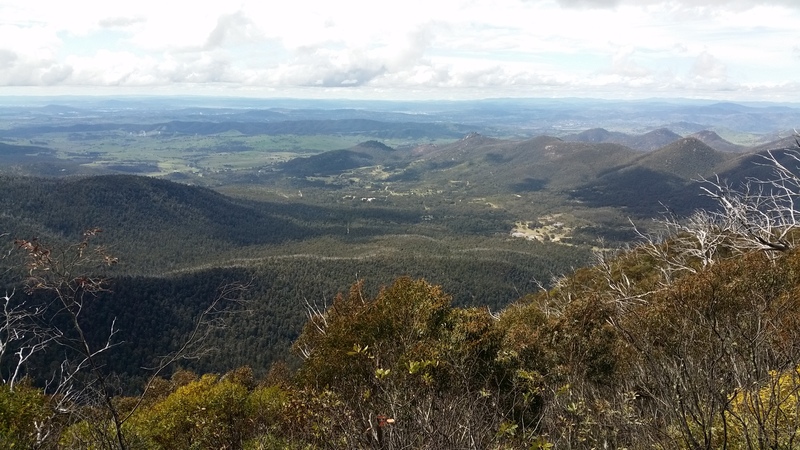 This first photo is taken during a walk along Bullen Range VK1/AC-033 looking west. 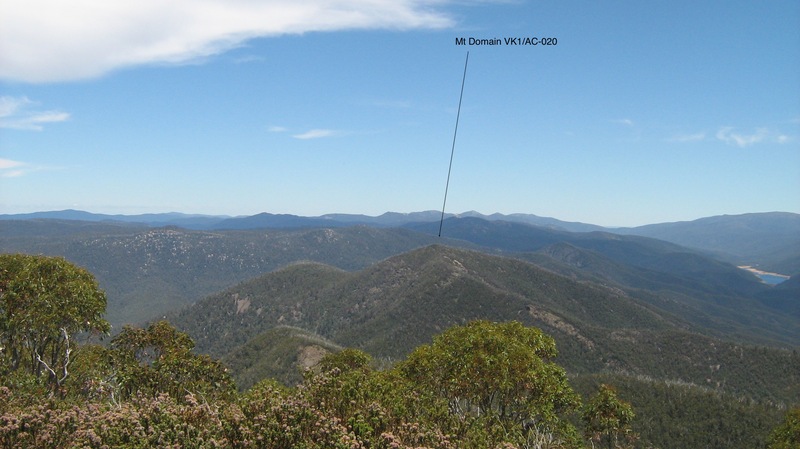 View of Mt Domain VK1/AC-020 from Tidbinbilla Mountain VK1/AC-013 looking south. The dam to the right is Corin dam. 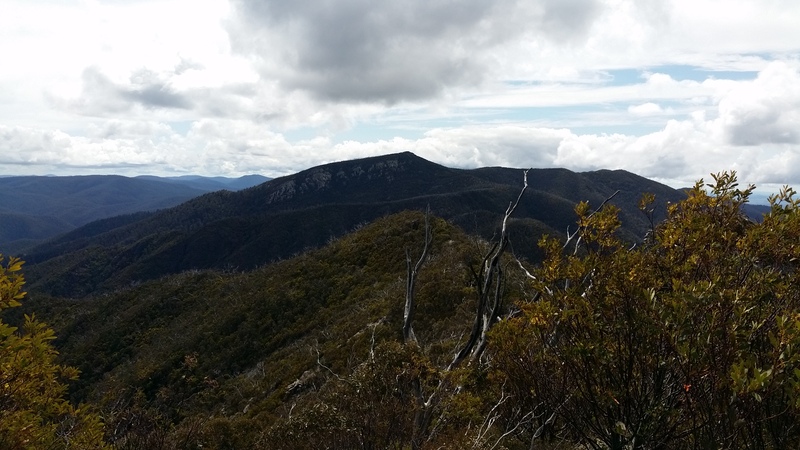 The view across the mountain peaks is the heart and beauty of Namadgi National Park. 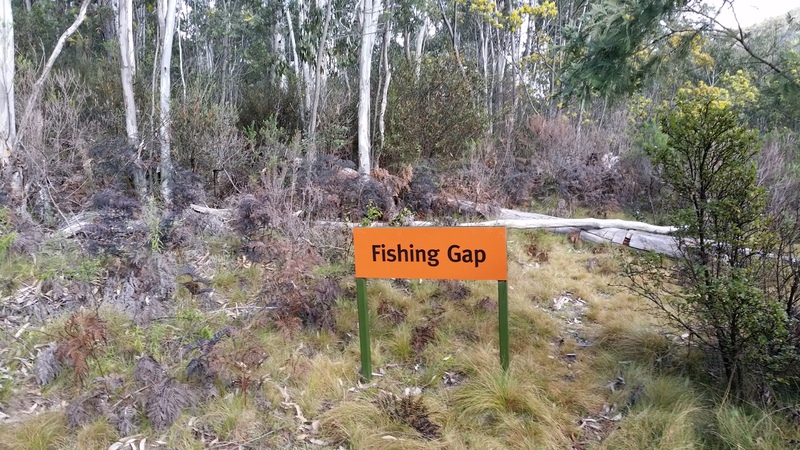 at Fishing Gap 4 km from gate. From here the trail heads north-east into the scrub (see next photo) Don’t forget there are no fish at fishing gap, so leaving the fishing rod and reel at home. 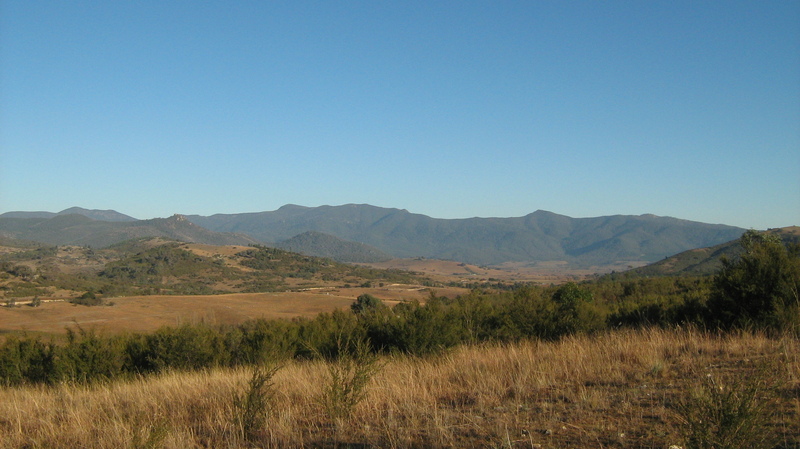 The gap is a saddle between Mt Domain and High Range. 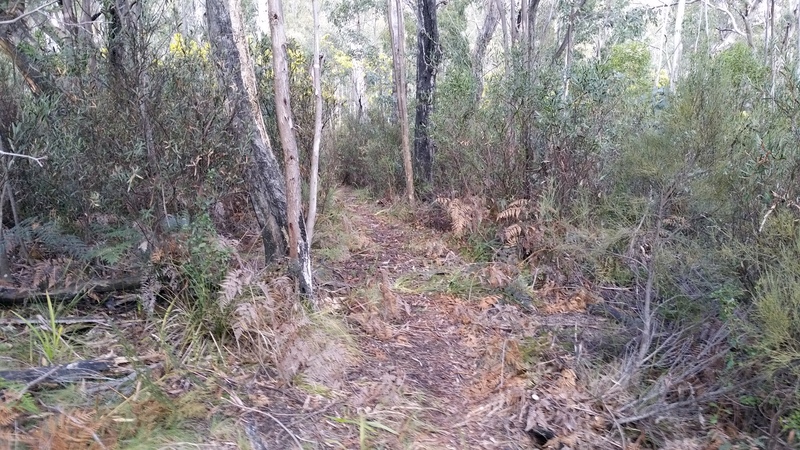 walking trail starts out easy enough however the trail gets progressively harder, seriously bloody hard! from here the gradient changes rapidly to 30% then 50%, that’s a 1 metre climb over 2 metres, I wasn’t joking around when I said this section is steep. 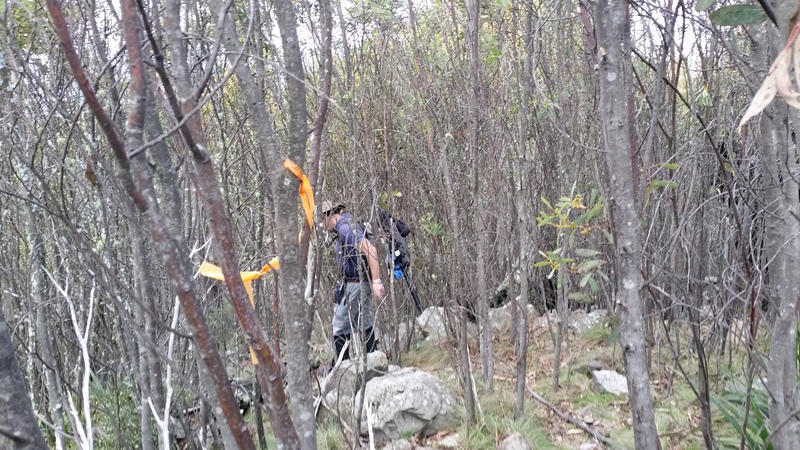 you can see a faint foot-pad trail from previous walkers, from here the trail is marked by tape markers hanging from tree branches often above head height. It pays to look up! 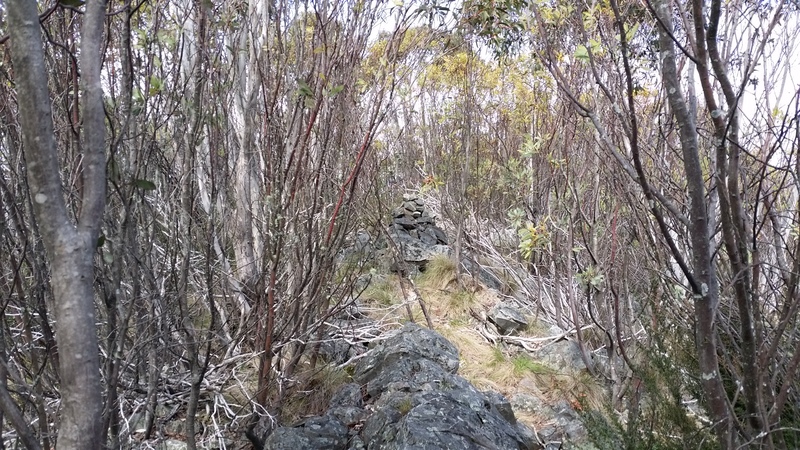 200 metres to go, with the worst of the regrowth is behind us, we found our way on to a narrow granite rock ledge leading to the summit cairn. on the summit, we made it, 2 hours and 48 minutes so happy to be here. 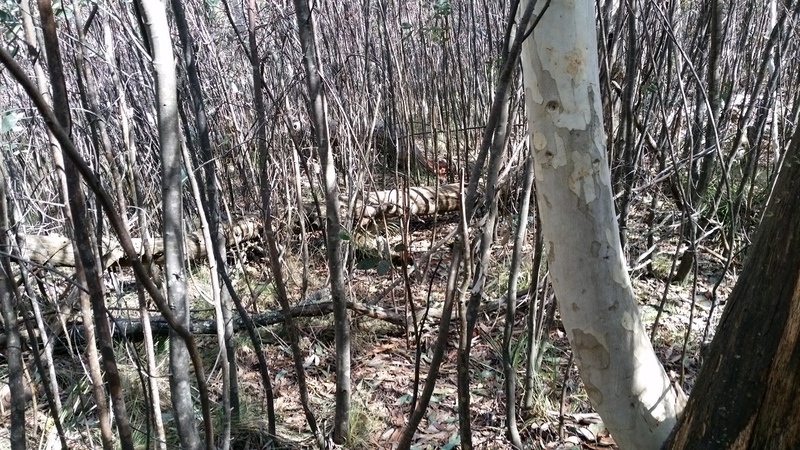 The Trig Station only 20 metres away is in the scrub among the eucalypt and wattle trees. 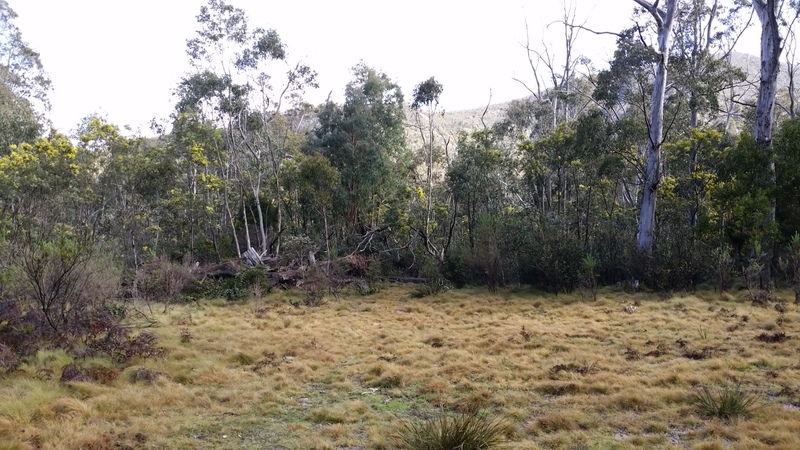 After the excitement of making ‘Goat’ Al worked Tony VK2RI in Bowral 180 km north-east, that’s right 180 km from 5 watts output in to a 2m Slim-Jim antenna mounted 4 metres about the mountain peak at 1506 metres ASL. Following the surprise of working Tony, Al finished the 2m session with a QSO with Mark VK1EM. 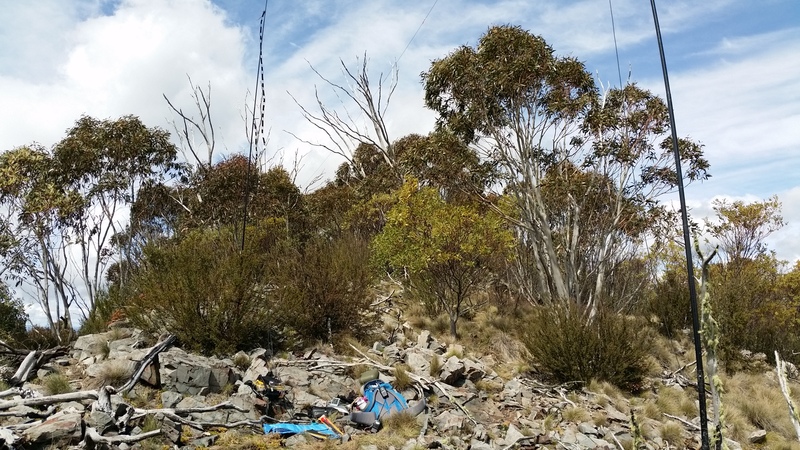 VHF/UHF Summit to Summit (S2S) QSOs included Andrew VK1DA/p at Boboyan Range, Andrew VK1MBE/2 at Mt Cowangerong and Graham VK1GVC/p operating from Mt Ainslie. 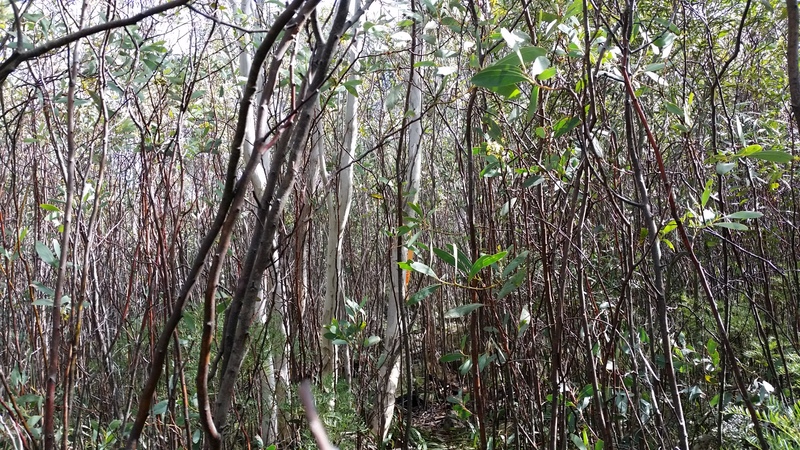 Tidbinbilla Mountain 3.5 km as the crow flies. My last visit Dec 15, I must return to this amazing peak soon. 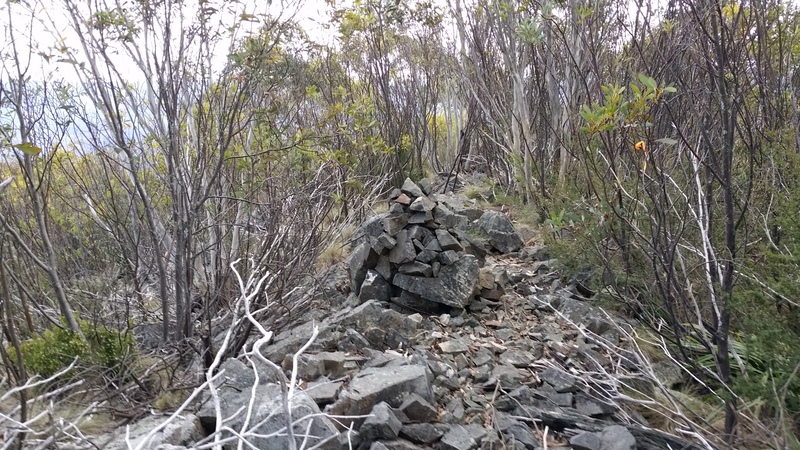 Mt Domain Trig along a very narrow opening in the scrub. No room for antennas here! No 2m or 70cm distance records set today, however Al worked Tony VK2RI in Bowral on 146.5 MHz FM, that’s a signal path of 180 km! Al was operating my FT-817ND at 5 watts feeding a 2m Slim-Jim antenna. Go Slim-Jim! Next activation report – ? Another excellent write-up Andrew (I’m a bit behind on WordPress catching up!). I really enjoy the mapping and statistics as much as the pictures and reports. Did you do a post in the past on your mapping equipment/software? Hi Chris, good question. No not specifically for mapping software or operating a portable GPS. What I have attempted to do is demonstrate the usability and effectiveness of both through my blog posts. I think you get the idea. I never really know if that level of detail is of interest to the readers? Clearly, some readers share a common interest with me. Great post Andrew. I’m a new Ham and this is the best SOTA summary report I’ve ever read. I’m still learning the details of running my HT, but I just bought an 817ND and plan to learn how to run it over the cold winter months. I’m a backpacker and plan on lots of QRP in the near future. Also planning to pick up my General over the winter. Thanks for taking the time to post!